What is a Hippocampus? 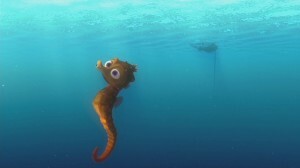 It is Latin for Sea horse – hippo meaning horse and kampos meaning sea monster. Not a creature people talk about too often. Why don’t we discuss this sea creature a little! So we talked about a couple aspects of their bodies, let’s continue. Like most sea creatures, sea horse’s eyes are independent from each other. This is very useful with predators and prey. “Unlike most other fish, sea horses have an exo-skeleton. Their bodies are made up of hard, external, bony plates that are fused together with a fleshy covering. They do not have scales.” They all have prehensile tails ,which help in “strong currents and waves.” Sea horses cannot swim well, so “they rely on their dorsal fin.” This fin will beat between “30-70 times per second.” Pectoral fins either side of the head help with stability and steering. “The Traditional Chinese Medicine Trade takes in excess of up to 150 million seahorses a year from the wild and these are used for all types of medicine. The Curio Trade takes approximately one million seahorses from the wild. Along with shells and starfish; they are deliberately taken from the sea and left to die in the boiling sun. They are then sold as souvenirs, sad and sorrowful reminder of once beautiful creatures. Those babies are completely on their own once born. “The first two to three weeks of their lives” are spent “drifting along in the plankton layer of the ocean.” Unfortunately, “less than one in a thousand will survive long enough to become an adult due to predators.” If not predators, I am sure the size of sea horses does not help in survival because the currents can become unbearable. Sea horses are just little creatures that people sometimes forget about them I always found their way of life to be quite interesting. I hope you gained some new information and fun facts on our horse-like sea monsters! Resource for most information in the blog. Gained video from this site. This entry was posted in Uncategorized on October 22, 2015 by Caroline Maria Teti.